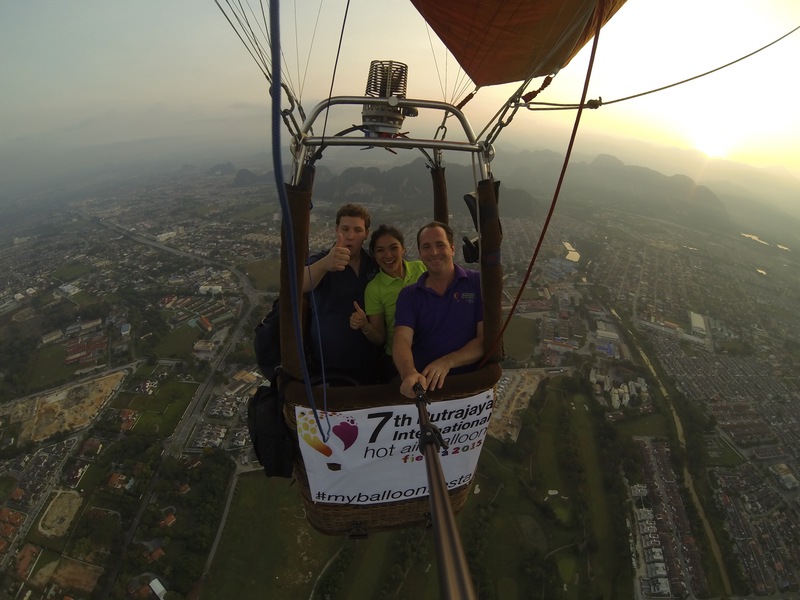 Now everyone can enjoy a flight over this magnificent city of Putrajaya. How long the flight will take? Our flights will last on average 45 minutes to one hour, depending on the weather conditions. Flights over 30 min are deemed completed. The whole experience including light pre-refreshments before the flight, safety briefings, set up the balloon and packing at the landing field will lasts between 2 to 3 hours. What do we see while flying a hot air balloon? The exciting thing about ballooning is that we just don’t know where the morning will bring us to. Watching Putrajaya in the crack of dawn, you will be captivated by the architectural wander of modern monuments and buildings heavily influenced by the islamic and eastern design. Most of the time you get to cross the beautiful Putrajaya lake and you could say hi to the residents on their bike or jogging along the lake. Can we choose where to fly to? The balloon can only fly where the wind takes us. We can not pre-plan where it will lands! The hot air balloon is one of the safest forms of flying. Our flights are therefore executed by professional pilots who dispose of all the necessary licenses and meteorological foreknowledge. Each year, our balloons are checked by the European Aviation Safety Agency (EASA), but also by the manufacturer. Our pilots are assisted by a well-trained ground crew which will drive the passengers safely back to the meeting point. There is scientific proof that it is impossible to be afraid of heights when there is no direct contact (for instance by means of a rope, ladder, wall,…) between you and the ground.Vertigo is an instinct that warns you for dangerous heights. Your subconsciousness ‘measures’ the distance between your eyes and the ground by means of a reference (rope, ladder or wall). Take away this reference, and your ‘measuring system’ stops working, even when you consciously think about vertigo! Besides, do you experience vertigo in an airplane? How many people can fit in one balloon? We currently have 3 balloons in service. 1 balloon for maximum 3 passengers, another for 6 passengers and 1 big balloon for maximum 10 passengers. In the 6 and 10 passenger balloons, the basket is divided in compartments for the passengers to guarantee their comfort in flight. The take off site is situated in Putrajaya Precinct 2, in front of the Skyride Festival Park. Together with the booking confirmation the passengers will receive more details of the take off field. For special occasions or unexpected situations the pilot can decide to change the launch field to another location. Wherever the wind takes you! This could be in Cyberjaya, Dengkil or in Putrajaya itself. Can we fly at sunset? No, we don’t provide sunset flights in Malaysia. This is because the weather conditions are in the afternoon not suitable for a safe balloon flights. For safety reasons there are age and height restrictions. We set minimum age of 6 years old, but as a general rule, all passengers must be able to see over the basket. Every child under 12 years old needs to be escorted by an adult. Yes! Myballoon adventure only operates when the chief pilot on duty decides that the weather is suitable and it is safe to fly! Therefore in an unfortunate event that we have to cancel the balloon flight at the launch site for safety reasons, we will refund 100% of your payment. Why do i have to give my weight? It is important that we receive the correct weight of each passenger as soon as possible. The chief pilot needs this figure to calculate the total ballast of the basket, so that he can determine the total amount of lift available on that day. We are flying over the administrative capital of Malaysia with many government institution buildings and restricted areas, the Malaysian National Security require for us to share all the passengers details for safety reasons. All the passport copies and details will not be used for commercial purpose. Yes! 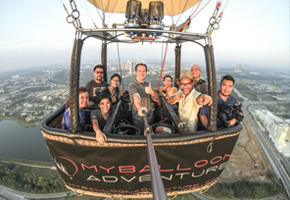 Myballoon adventure has a third party liability insurance, type ‘combined single limit’. This policy offers a better covering than the minimum legal obligations. So we also offer quality in this matter! A lot of people think that it is colder during a balloon ride. We wished it was true! We sail at the same speed as the wind (we fly WITH the wind), you won’t feel any wind-chill factor. Furthermore, the radiation heat of the balloon heats us too. The clothes you wear during a balloon flight can be compared to the clothes you would wear to go on a walk that day. However, we do advise waterproof shoes and some kind of hat.